Thank you ever so much Mrs. Kendall Boggs at Kendall Boggs Fine Arts and Crafts for nominating me for this wonderful award! I am truly honored. 4. Share 5 interesting things about yourself. 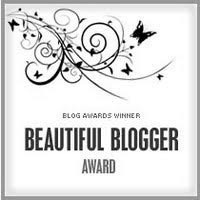 5.Nominate 7 bloggers and let them know on their blog. 1. I’m named after my great-grandmother Montye Mae from Dallas, Texas. 2. I took clogging when I was younger (it’s the country version of tap). 3. I love to go to flea markets, estate & yard sales; my house is full of random treasures! I have dreamed of going to Brimfield and Round Top, maybe one day. 4. My favorite movie is Shag; seen it probably 50 times… Embarrassing - I know! 5. The most important things in my life are - Faith, Family and Friends. The three things that got me through this past fall.